Don't worry when you see this mooncake cracked after baked (one tip advise from the chef is do not overbeat the butter and sugar), it will come back to the same shape after it has been cooled down. This time i did not top with the usual melon seeds, instead sprinkle black and white sesame seeds..resulted very fragrant sesame aroma..
1. 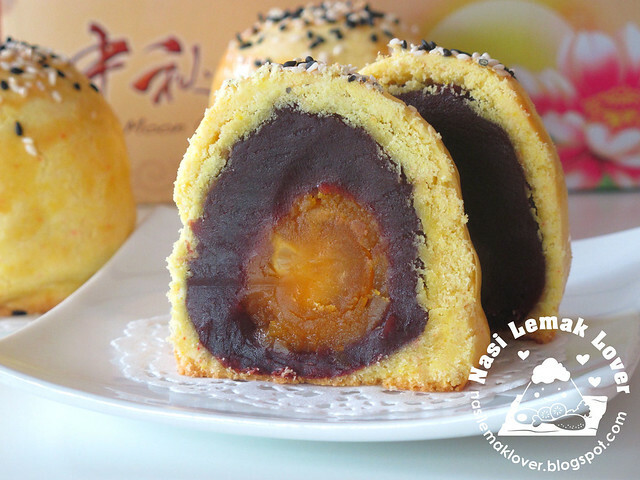 Weight red bean paste for 40g each and wrap with 1pc salted egg yolk and shape it to ball, set aside. 2. Sift plain flour and custard powder, set aside. 3. Beat butter and icing sugar till creamy (do not over beat, 2-3mins just nice). 4. Add in egg, beat well to combine. 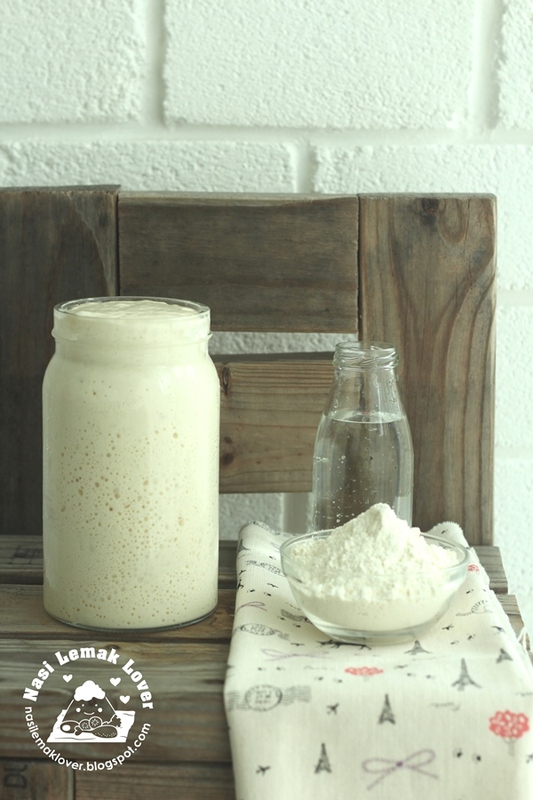 Add in sifted flour and custard powder, lightly to combine to form a soft dough. 5. Cover with cling wrap and chill in the fridge for 30mins. 6. Weight dough for 50g each and shape to ball. 7. Flatten dough with your palm and wrap up the red bean paste filling into it and shaping it like an egg shape then place on baking tray (you may dust hands with Kor Hun (cooked glutinous rice flour). 8. 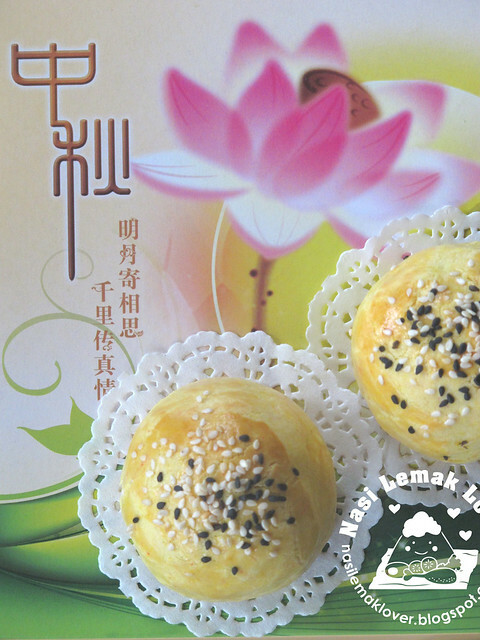 Lightly brush the whole mooncake with egg wash and decorate top with black and white sesame seeds. 9. Bake at pre-heated oven at 180C for 20mins. 10. Leave to cool and store in mooncake box. Beside this, please hop over to check out Quay Po's Cooks event of THINK OUT OF THE SHELL - Join the Pastry Challenge which organized by Nutriplus. This contest is good because it means for home bakers only, like you and me but not Professional bakers. What you need to do is just create a recipe using Nutriplus eggs. Ya, another great news from Quay Po, her son Nick Davis new single "Lost in Time" is available in USA iTunes stores. Lets come and support this young and talented man !! Sonia, I like custard pastry skin for the mooncake, I am sure it taste delicious. And your mooncakes really look so well baked, nice! Sonia, thanks a million for the shout out! Hugs hugs, Muax, Muax. You are a great friend. yum, Sonia! Seeing all these mooncakes on blogs really makes my craving stronger..haha. Can't wait to eat them! Everyone is baking Shanghai Mooncakes!! Hmmm......I loves this type of mooncakes! Recently wet markets/egg shops all ran out of salty eggs. Can't find any left!! Should have made my own salty eggs next time round. Your Shanghai Mooncakes looks so beautifully done! You are so professional! I like the crust of these mooncakes very much as its buttery and crumbly! Yours looks very flaky and delicious! Wow! These looks like those sell in the bakery shop. I like Shanghai Mooncake, this is yummy!! Your mooncakes look nice . I haven't started making shanghai mooncakes yet, I can't wait!! I think I might just go with your recipe using butter and custard...I'm 100% butter person, lol! But I'm not a fan of salted egg ...hope it will still be yums! OMG, my best selection of mooncake!! 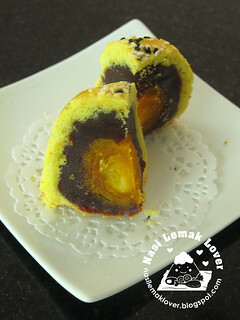 I love this kind of inner texture, moist inside, especially the salted egg, it looks moist as well!! Hope I have time to make this. It is very tempting ! Oh ur mooncake engine work very well ... Excellent production with multiple varieties hehe.. I'm so impressed with the various mooncakes you have been doing and your willingness to share with us your knowledge too:) Thank you! Sonia, you shd definitely join the Nutriplus contest. I think you have very very high chances of scooping the top prize! i Love shanghai moon cake! Thank you so much for sharing your recipe.. will try it out tomolo! And I've just a batch of salted eggs ready ... perfect! 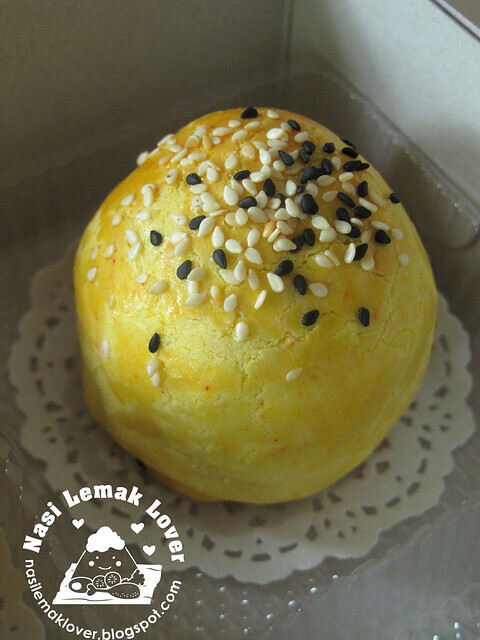 Oh I plan to make this with red bean and salted egg too..must start must start..looks yummy. you did it so pretty and the crumbs are so nice..perfect! I cannot believe it's moon festival is around the corner. I clearly remember last year when you were making all the mooncakes. Already one year!? So fast.... You are always so good at making these. Banyak jenis moon cake ye Sonia... saya biasa makan, tapi yang Cosway punya. Wow... looks yummey... and flakey. Sonia, I have enough of Shanghai mooncakes, hai, can't eat like this, want to keep fit mah, not time to exercise also, must control my diet. I know what you said about the combo of eating the mooncake with the salted egg yolk, just like the "ying & yang" match! Your mooncake looks lovely and moist. These look totally intriguing, Sonia. Looks perfect, I love Shanghai mooncakes! I have never tasted this type of mooncakes..looks so tempting..love it. 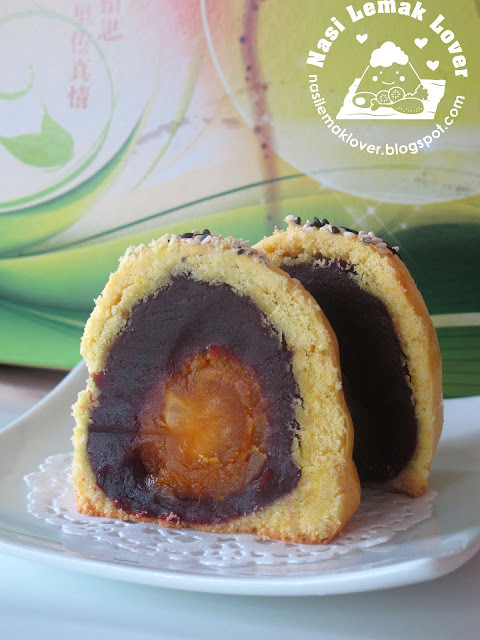 I tried this recipe but my mooncake turns out hard and crunchy after baking... any idea why? Can I reduce oven temp to 170 degree and bake longer time? Jo, i surpried yours turned out hard, it should not this way, i dont think is the temperature problem. Maybe it was due to beating butter and sugar, you have to beat till pale and light. And try to use better quality of butter like Anchor, SCS or etc..
Dear Sonia, i just tried this recipe last night. To my disappointment, the shape collapse during the baking and become like "ang ku" shape V_V"
During the shaping, i find the dough quite sticky and harder to manage compared to the 'cheesy' recipe but still mould it. Perhaps i shoudl already use the koh fan? i follow the recipe exactly but not sure what went wrong? Could you please help? Kah Chin, even it collapsed, it should not look like "ang ku", because the filling will not collapse, and filling should shape like egg shape "oval shape". I suspected this collapsed was due to high oven temperature, maybe you can reduce the oven temperature, and move the rack slightly lower. And the dough should not that sticky, otherwise you can use Kor Fun to dust your hands. Hope this helps. Jo, what i did with the salted egg white, i use it to steam with minced pork, seasoning with little light soy sauce and pepper, already yummy! Sonia, jus wondering if I can reuse the filling fr my previous unsuccessful mooncakes for my new batch? Is it advisable to do so? Kah Chin, both recipes are using difference ingredients, and every oven is difference, so you need adjust accordingly. Ya, this pastry is soft and crumbly, it supposed this way..
Jo, i am not sure, but i think should be ok. These are a so pretty! Your mooncakes are always turn out so beautifully. This version sounds delcious! Your style is very unique in comparison to other folks I've read stuff from. Thanks for posting when you have the opportunity, Guess I'll just book mark this blog. Hi Sonia, I baked these today. They are really wonderful!!!! I have got 2 questions here.....my salted egg yolk is kind of light in color and looks quite dry (without that "oily orangey" look) although the taste is perfect. The other question is when I cut the mooncake into quarters, part of the salted egg yolk drops out; it does not stay intact in the red bean paste. Kindly help me and thanks!! Your stated beat butter with icy sugar for 2to 3min,may I know for beating above mentioned is using hand or egg beater machine?if use egg beater machine at which speed:low,med or high speed? Hi can i use homemade custard instead of custard powder? Dont want to buy a whole pack of custard powder just to try this recipe? Hi Sonia, I baked these a few times already but somehow I could not get the shape right. Mine spread out on the bottom that they join to each other during baking and also the top is like a dome instead of egg shape like yours. Would you kindly advise is it my dough is not done properly or is it my wrapping skills? Thanks! teo ai li, you may lower down the temp to 160-170C. Also use a firm type of lotus paste filling. If the filling too soft, it will easily out of shape. Hi Sonia, thanks for your reply. I used red bean paste with salted egg yolk. Thanks! Hi can I know how long can these shanghai mooncakes last at room temperature and also in the refrigerator?